Burnt Offerings was a book that had never crossed my path until very recently. When my Horror Reading Challenge group on Goodreads decided that this should be one of our group reads this month, I decided to take the plunge! It looks terrifying and it was an influence for The Shining! How could it not be fantastic? This book is, in a word, strange. I expected horror and what I got was just a super weird story without much resolution or explanation. The Rolfe family decides to go on a summer vacation and ends up taking up residence on an estate that seems way too good to be true. In exchange for super cheap rent for the summer, Marian takes on the responsibility of caring for the owners' elderly mother. What this actual translates to is that she has to leave a tray of food outside her door a few times per day. Ben and Marian are the main characters in Burnt Offerings and I really couldn't care less about either one of them. In the beginning of this novel, the two are supposed to be happily married and slowly their marriage changes because of the house, but I honestly couldn't tell a difference. Both characters were very flat from start to finish. The only person I was able to sympathize with at all was Aunt Elizabeth, and that was only when she wasn't complaining about something. Unfortunately, there's no real horror in this horror book. In place of scares, weird things happen. Ben acts a little out of character, Marian becomes obsessed with the house, and Ben's elderly aunt acts more elderly. Nothing terrifying ever happened, which was highly disappointing. There were some moments of unease and suspense, but ultimately I was left wanting a lot more. I never truly got the sense that the house was actually evil and I never quite understood what "really lied behind that locked door." It's possible that this book would have been much better received in the early 70s, but with so much fantastic horror out there now, this just doesn't hold up. 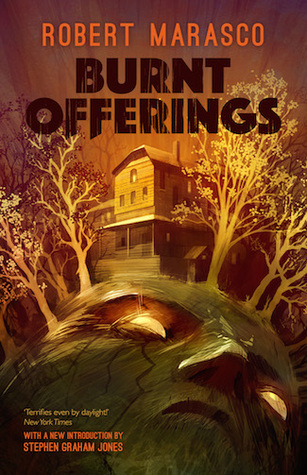 Burnt Offerings suffers from boring characters and severe lack of thrills. This book was inspiration for The Shining? Seriously, just read The Shining. THAT book is terrifying!